When you spend most of your time eating Thai food, whether it be on the street, in a restaurant or at home, sometimes you just feel like a trusty sandwich. Surprisingly, the Max Value supermarket chain actually makes some pretty nice sandwiches. My personal favourite is the egg and salad sandwich – I think it has something to do with the mayonaise they used – it’s delicious. So the other day when I went to buy my trusty egg sandwich I discovered this sign. It isn’t the easiest sign to read – my first thought was ‘Lack of Bird Flu’ – well that’s good to know. Followed by a chuckle at how badly written it was. I don’t want to joke about Bird Flu as I know that it is serious but I hadn’t even realized it was in Thailand – on further research I discovered it isn’t yet. So I imagine this is just trying to came the nerves of all those worried egg sandwich loving people. 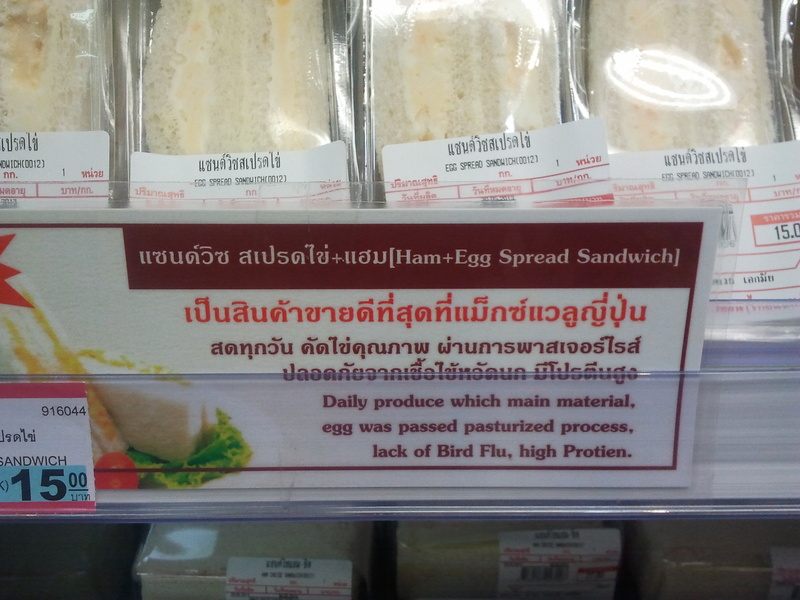 Fingers crossed Bird Flu doesn’t come to Thailand and that I can continue to enjoy my cheap egg sandwiches.